You are shooting a projectile on a sloping field. 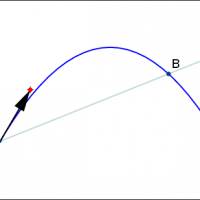 Drag the red point to change the angle of the projectile and try and maximize |AB|. Click the button to see the focus of the parabola.